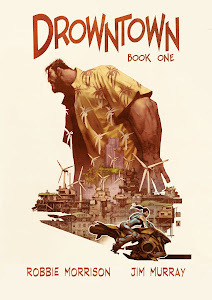 DROWNTOWN: DROWNTOWN AT OK COMICS! While Amazon and other online retailers undoubtedly offer a great service, there's nothing like the personal touch of your local independent book or comic shop, who share the same passion for the medium as readers and creators. The award-winning OK Comics in Leeds is offering an exclusive Limited Edition Drowntown Print, signed by Jim and me, to customers who buy or order a copy of the book from them. The image shows Leo Noiret, one of the lead characters, enjoying a quiet pint in the Stag's Head sub-pub, with the sunken streets of London visible through the window behind him. Personally, I think they're being modest by calling their shop OK Comics. FAB Comics is more like it if you ask me.